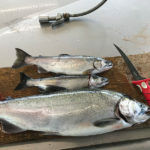 Coho Salmon are also known as silver salmon (or silvers for short). These salmon start out having a dark blue to greenish backs with silver sides, then change color when they enter fresh water. There they get dark spots on their backs and their sides turn bright red. Coho is the fish that really started the Great Lakes salmon fishery. 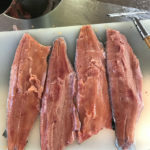 Like Chinook, Coho is native to the Pacific coast of North America and parts of Asia. 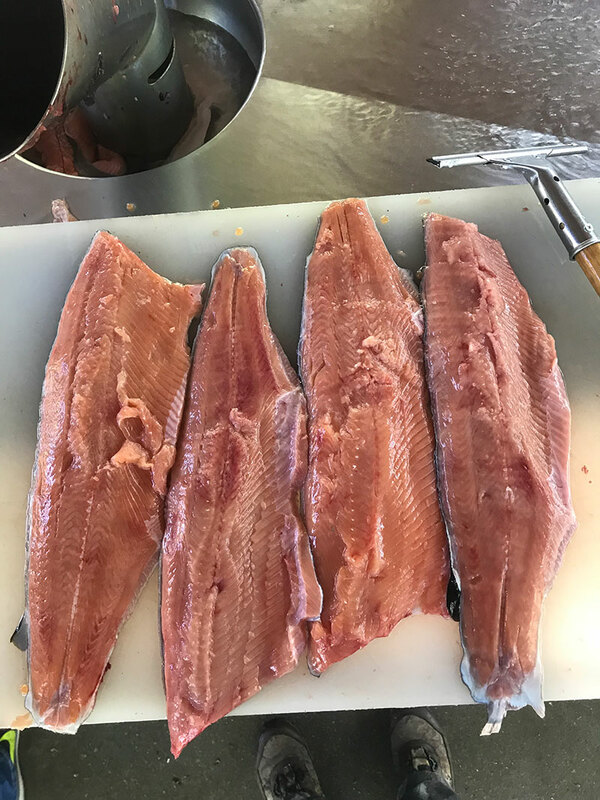 They were introduced into the Great Lakes in 1966 when smolts where stocked in two Lake Michigan tributary streams; Platte River and Bear Creek. There was excitement from anglers and fish managers when coho made their first spawning run in the fall of 1967. 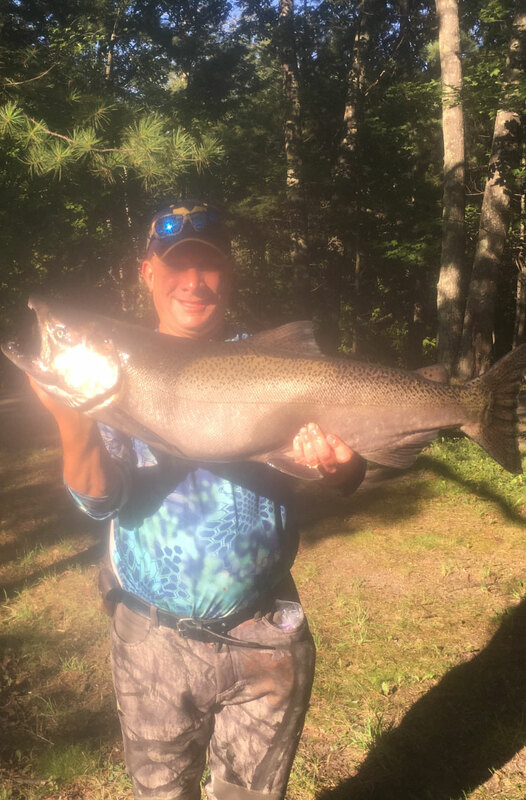 Since their first spawning in 1967, the coho has become a popular sport fish, and many people come from all over the world to fish Michigan’s great coho fishery. Coho salmon can be caught at almost anytime, but they tend to migrate later than other fish. A majority of the coho salmon start in the Platte River just a little way from the state’s coho hatchery. 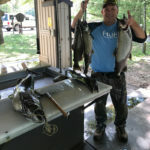 In Michigan, the coho salmon run has been fantastic for the last couple of years! Due to the plentiful populations of the Coho, there are few fishing limitations. Check the DNR for more details. 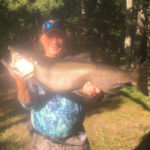 When it comes to fishing for coho in Michigan, hiring a fishing guide on the Platte River is a great choice. If you are not an expert or familiar with the Platte River a guide for coho salmon river fishing can be your best friend. The first thing you want is the proper lures to catch the fish. Different types and sizes of lures depending on the time of year are crucial to catching the big fish. Also, horizontal jigging is a good technique to use while catching salmon. Of course, moving and searching for new areas can help as well, and a guide will help move you to the proper hot spots. Now, of course, there are some rules and regulations set by the state when it comes to fishing. Anyone over the age of 17 in the state of Michigan is required to have a fishing license to fish. The price is about $26 for resident and $76 for nonresident, you can get a 24-hour license for $10 for residents and a 72-hour license for $30. For questions on laws and restrictions feel free to give us a call at 231-557-2755. Your guide will answer your questions as well. When you hire the Walleye King as a guide for your fishing trip, he will give you all the tips you need to catch some great fish. 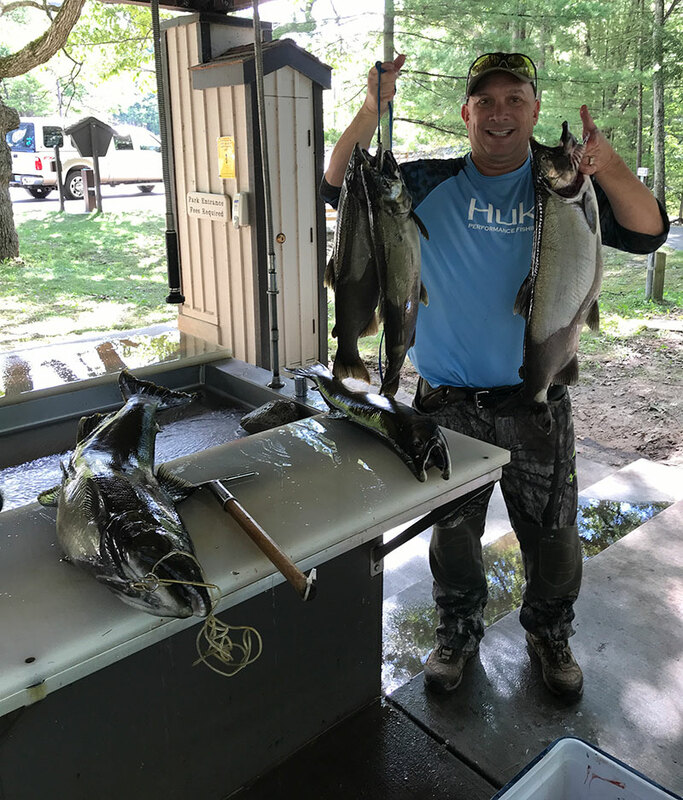 Unlike most guides that take you out and just drop you off, Brian is out there fishing with you. So, if the fish for some reason is not where we are, we’ll pick up and go find them! We take a more Pro-Active approach to fishing. Our idea about having a good time is not only the experience but actually catching the fish. So we are more of an “extreme” guide that will keep moving until we find and catch them! For our guided fishing tours on the Platte River, you can either have one or two people max. The fishing trips usually last about 7 hours and the guide will provide a boat to get to the desired fishing destination. Dress appropriately for fishing, keep in mind during the summer months to bring some sunblock. Weekend trips can book fast, so call right away at 231-557-2755 if you have a preferred date in mind to reserve your date of choice. 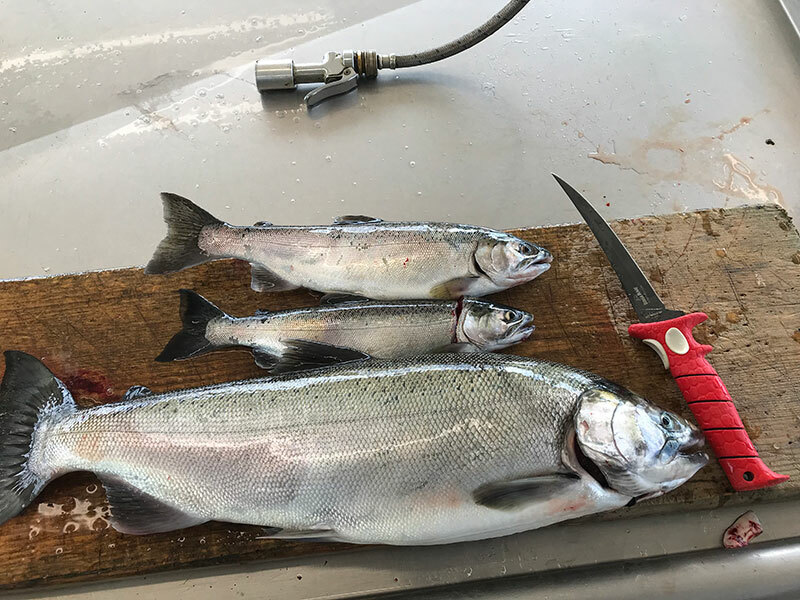 Coho salmon really run from mid to late August through the end of September. Check out our Pricing, we know we will make it worth your while! 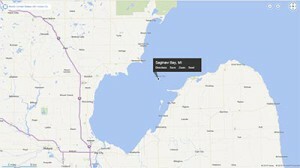 The Platte River is located in the Northwest part of Michigan’s Lower Peninsula. 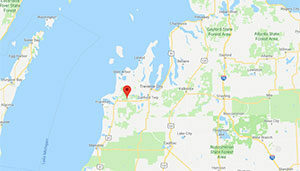 Its mouth is located in Sleeping Bear Dunes National Park and about 20 minutes North of Frankfort and about 40 minutes South of Traverse City. The Platte River is about 30 miles in length from its origin at the outlet of Lake Dubonnet. Being in a national park, you will need a national park sticker to park or the cost is $5 a day to park.